The wireless router went out in my apartment and since then I haven't been able to get my photos online - and what is a post without photos? The first pair is in Cherry Tree Hill Superglitz Monet. My first pair of socks done two at a time. 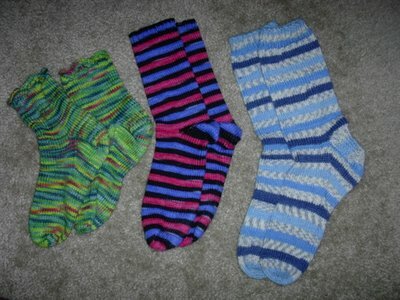 The second pair is custom dyed sock yarn by All Things Heather, my first socks done toe up with short row heels. Finally a pair that has been waiting for completion for months. I hope my boyfriend likes them!